While Virtual TimeClock can be used on a single, centrally located computer, it works best when the time clock server runs on its own computer and you use TimeClock clients on individual desktop computers or at centralized time clock stations. The server setup process is simple. It took a matter of minutes to install the software, create my time clock database, and get the system up and running. The Virtual TimeClock server can be configured to automatically back up your employee database at regular intervals in a location of your choosing. The server application can also be secured with a password. 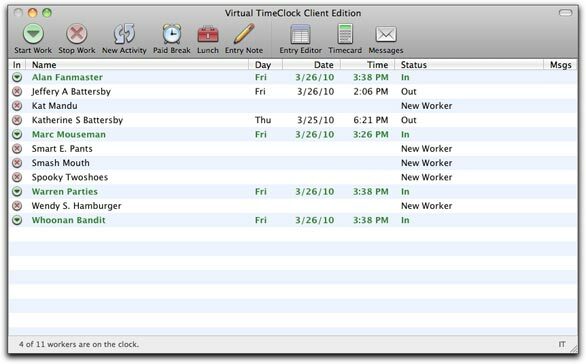 Virtual TimeClock '10 offers an easy way to clock employee's work time. 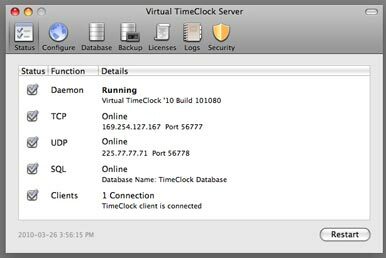 To add users you need to use the Virtual TimeClock Pro client, which you can either use on the server or install on any computer on your network. The client automatically locates your server if it’s on the local network or, if your server is on a different network, you can manually connect to the server by entering its IP address and the network port that the server is using. Once connected you can begin adding users to your database. Virtual TimeClock Pro offers two ways of adding users to your database: you can either enter each user manually, or you can import users from a CSV file. If you have more than a few employees the latter option is the better choice as importing data is orders of magnitude less frustrating than entering users manually. The data entry window includes six tabs (Personal, Access, Employment, Wages, Leave, and Notes) that, as you enter information into each tab and then move to the next, displays a save dialog asking if you want to save the changes you’ve made on the current tab. Redcort Software states that the constant save dialog was added so that users could make sure they wanted to save the data changed in the current tab, but in my brief experience the save dialogs hindered more than helped the data entry process. Virtual TimeClock Pro doesn’t offer a way for you to create users based on templates. For example, if you have a Maintenance group whose new employees begin working at your company with five sick days and who accrue a day of vacation for every month worked, you can’t create a template that has those options as default features. Also, it’s not possible to delete more than one employee at a time, and when you do delete an employee card you are met with not one but two warning messages asking if you’re sure you want to delete the employee. Those user management annoyances aside, Virtual TimeClock is a stellar time clock application and this new version offers dozens of options for customizing how you control, collect, and report your employee’s work, vacation, leave, or other benefit time. For example, if you have employees (such as delivery people) who don’t have access to a time clock throughout their workday but who are required to take a lunch hour, you can configure the program to automatically deduct the lunch hour from their day. Or, if you offer your employees paid breaks but don’t want them milking their break time, you can configure Virtual TimeClock to clock employees out if they don’t clock in after a break threshold is reached. Redcort also added a new display group option that allows you to create specific groups for the different areas where you might have a timeclock. So, by creating a warehouse group and adding your warehouse employees to that group, a time clock computer in the warehouse will display only those employees who should be clocking in the warehouse. Virtual TimeClock Pro offers several different customizable reports, including reports by department, leave reports, and detailed individual timecards. Employees can also print personalized timecards at the end of each week. The program also exports time clock information directly to CheckMark’s Payroll software and Redcort states that they have contracted with both Paychex and SurePayroll and expect to include integration with those payroll services in a release that will appear later this year. Virtual TimeClock ‘10 offers both small and large businesses a powerful tool for collecting employee’s time information using existing computer hardware and without requiring companies to invest in hardware-based time clock systems. While the process of adding and managing employees is at times frustrating, once users add employees Virtual TimeClock Pro offers compelling time tracking options for small and large business users alike.